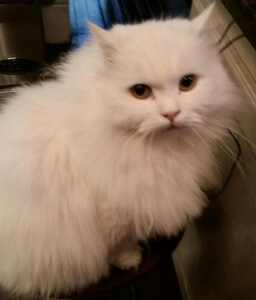 Blue is a 13 year old white, male Persian cat who lives at The Ducote-Williams House. When he was born, he was silver with blue eyes. As he grew older, his blue eyes turned gold… The name Goldie just did not fit his majestic stature. Oh yes, he is the King and all animals big and small understand that at first glance. Blue has his special stool next to me at the bar in the kitchen. He likes trickling water from the faucet and has me pull his stool over to watch me at the sink. He especially likes the sensory integration in the process of me peeling potatoes. 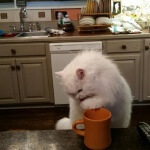 If he is in the mood, usually in the morning, he will paw at me until I give him his orange mug of milk which he drinks with his paw. He then goes down for his morning nap on which ever cushion in the house suits him at the time. On occasion, he does his palette stretch-out sleep position and extends more than 2 feet long out from front to back paws. If you are talking about him, he may wag his tail in acknowledgement, but won’t be inconvenienced by sitting up. What will get him up is if I happen to sneeze. He will jump up and run over and cry at me to make me stop. A belch or cough won’t do it…only a sneeze. And don’t try to fake it, because he knows the difference. I think maybe because when a person sneezes, their heart stops beating for a second, I’m told. For “nighty night” (bedtime), he will come in, when he wants to, and perch at my feet. He again, when he wants to, will come and sit on my chest, snuggle his head on the left side of my neck and purr… Only on the left side, where your heart beats the strongest. Then he goes back to his perch. The only other time he comes to snuggle is if Tigre, the other big male cat, his believed rival, comes to snuggle. Also only on the left side. Tigre will move over or get his tail bitten. Oh, if I’m sick, he will lay at my side… only the right side…Go figure. Yes, they have their “pecking order”, or rather their “purring order”. What else does Blue like? Let’s see. He love rolls of toilet paper that he takes off the stand, carries around the house and growls like he just made a conquest. He loves tissue paper. He hates plastic grocery bags. He loves to chew on plant leaves. He will never get up on a tabletop except to get to a leaf, which is why I have no houseplants. He dislikes people who wear baseball caps. He loves his catnip box, but seldom plays with a catnip toy. He loves his tablespoon of can cat food he gets with his dry food in the morning. He loves his baby sister, Mia Marie (MiMi) the calico. He bathes her and protects her. If she is misbehaving and I threaten “time out”, he goes to her and paws her to make her stop misbehaving. He loves to sit by the window in the morning, but won’t go into the cat house pergola (screened in cat house with in/out door to the house) that I had built just for him and MiMi. Go, figure. He hates to go to get grooming, but loves it afterwards because he gets all this attention. That’s when we call him “poo cat”, because we can’t make out if its dog or cat after he is shaved. Blue IS the King of Cats!